I think I'm not receiving some/all emails from TellicoLife. How do I fix that? Here are the 4 most frequent reasons why may not be receiving the emails you want from TellicoLife. 4. Your email system thinks TellicoLife is "spam" and is blocking them for you. Items #1,2 & 3 involve your Profile in TellicoLife. Item #3 will require you to change some settings in your email browser. We'll show you how to check each frequent causes in this article. If after looking at each of these potential causes, you are still not receiving emails, please contact us at [email protected] and we will take a look. 1. Are you opted out of all emails from TellicoLife? 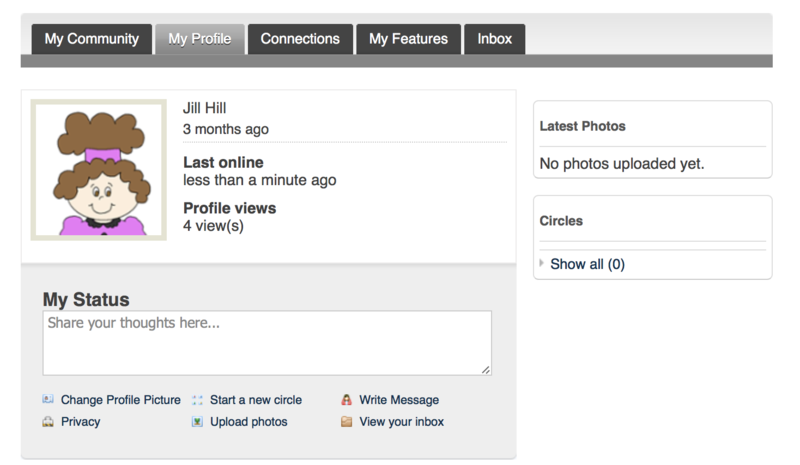 Hover over the My profile tab and select Contact Preferences. Scroll to the end of the screen for your Global Unsubscribe options. Make sure the option is set to Receiving all Emails. Contact preferences are also managed through my profile. 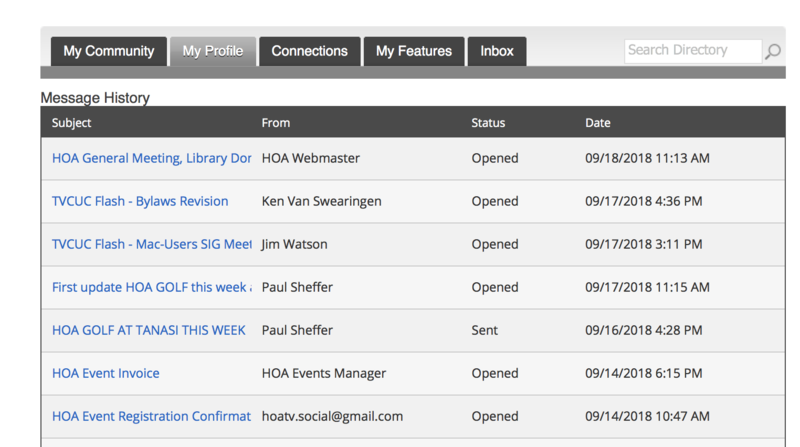 Slide the bar to turn on (green) or off (grey) each of the contact preference options. 3. 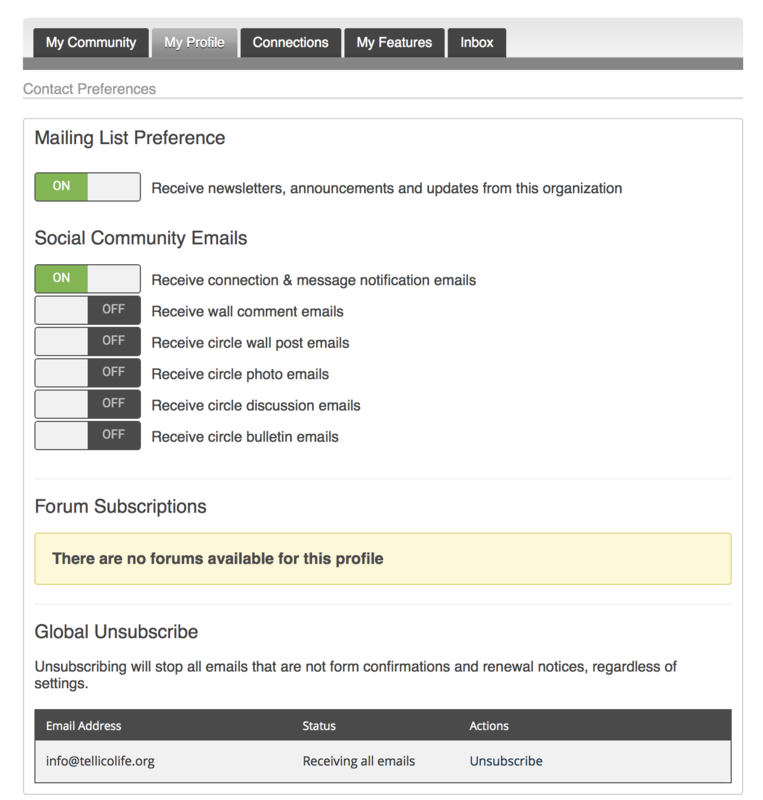 Is TellicoLife sending you the email you want? TellicoLife provides you a history of all emails you have received from TellicoLife. It can be found under My Profile > Message History..
Click on Message History to see the following screen. The most recent email is shown first. You are not subscribed to the club/organization's email Ex. not a member of the TV Singers Circle, nor not subscribed to the TV Hikers E-List. Or have not renewed your membership in an organization, such as HOA. You are subscribed or a member in good standing but it is under a different email address. To check/change your email address in TellicoLife, navigate to My Profile and scroll down to to change your email. Tip: You probably want to change your Username as well, because most people choose to keep their Username and Email the same. 4. Does your email system think TellicoLife is safe or spam? In GMail and macmail, this is done by adding a contact for TellicoLife with the safe email addresses. In Outlook, you add the sender's email to your safe list. Click here for a good article describing whitelisting emails for a number of popular email systems.